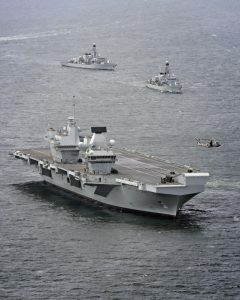 The United Kingdom Hydrographic Office (UKHO) has supported the safe arrival of HMS Queen Elizabeth into Portsmouth today by providing specialist marine geospatial and hydrographic expertise and data capabilities. As well as providing advice during data collection, the final dataset was then validated by the UKHO to ensure it was the to the highest Category Zone of Confidence – a criteria used to determine the accuracy and data quality of seafloor coverage for safe navigation purposes. The UKHO then used this information to update ADMIRALTY chart coverage of Portsmouth Harbour and Approaches, to support the safe arrival of HMS Queen Elizabeth.